What sort of kitchen sink will you invest in? 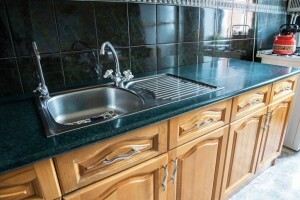 The kitchen sink, whether or not you realize it, is one of the most used items and appliances in your home. Whether you’re draining pasta, washing off your hands after taking out the trash, or rinsing off fresh berries from the farmer’s market, your kitchen sink is incredibly important every day. As kitchen sinks get so much use, it is important to take your time when deciding what type of sink is the best fit for your kitchen sink replacement. A deep basin allows you to prepare a lot of food at once or soak big pans without splashing water everywhere. You cannot easily use the sink for more than one thing at a time without a good amount of juggling. One large kitchen sink can work better nowadays thanks to the myriad of add-ons available, including rinse baskets (that make that juggling act a whole lot easier!). Two basins let you do two different tasks at once. You can be preparing vegetables for a salad in one and soaking a casserole dish in the other with ease. The ability to use two different basins also comes in handy when you are washing up dishes, as you can keep soapy water in one and rinsing water in the other. The smaller basin does not give you unlimited possibilities in terms of what you can use it for. You won’t be able to easily wash and soak large pans without a bit of bumping elbows unless you use the larger basin of the two. Many people who are mulling over a kitchen sink replacement that currently own two basin sinks do not want to switch back to a single basin. Three basins allows you the luxury of a lot of prep space and an independent garbage disposal, letting you keep the garbage disposal away from any food you are preparing and allowing you to use the garbage disposal even while dishes are soaking in the kitchen sink. Depending on the model of the three basin sink, it may not be possible to simply sweep crumbs or scraps off of the counter and into the basin with the garbage disposal. Farmhouse sinks have a distinctive apron front, which will give your kitchen a cool and vintage feel. Farmhouse kitchen sinks can also sit slightly beyond the counter line, allowing increased accessibility for shorter adults and for children. Farmhouse sinks, while beautiful, are a very specific design and aesthetic, so if your tastes change, you may find yourself with a sink you are less than happy about. When it comes to cleaning up the kitchen sink, rounded sides are much easier to tidy than square edges. If you prefer a more minimalist vibe for your kitchen remodel, rounded sides won’t fit in. Stainless steel is well known for being very durable and remarkably easy to clean. Stainless steel can scratch and need buffering to look spotless again. If your home has hard water, water spots can become an issue. Porcelain is a perfect choice for a vintage-feeling kitchen. There are also many different color options available. Porcelain sinks can chip or get scuff marks from metal pans. A natural stone sink can be matched to your countertops and give an authentic period look. Natural stone is on the expensive side, may require specific cleaning products, and is prone to chipping and scratching. Give Master Plumbing a call at (301) 650-9100 or contact us online to get more information on how our expert plumbers can help you with your kitchen projects. To see examples of our projects, follow us on Facebook, Twitter, and Pinterest. This entry was posted on Friday, July 8th, 2016 at 7:27 pm. Both comments and pings are currently closed.